Asking members of the cApStAn team to share their traditions for the New Year yielded some fun contributions. To start with, many pointed out, the New Year is not on the same date everywhere: according to the Orthodox Church Julian calendar, for example, the last day of the year is on 13th January, in the Republic of Korea most people celebrate the Lunar New Year (= Chinese New Year) rather than the solar New Year, usually in February, and in India different regions celebrate on different dates (e.g. spring harvest time or October-November). Many traditions go back a long way, e.g. to ancient Rome (eating lentils for good luck) or Celtic times (in France the evergreen mistletoe is a symbol of immortality). In many countries New Year’s day is also a religious feast, e.g. in Italy it is the name day of Saint Sylvester, in India it is a time to pray to local deities. A variety of foods are thought to bring good luck and prosperity: grapes in Spain, choucroute (pickled cabbage) in Belgium, traditional bread (Macedonia), or cake (Greece), with a coin inside, Tteokguk, rice cake soup, in Korea. Traditional drinks include rakiya (a strong alcohol made of grapes) in Macedonia, and the better known champagne, in France. And there is almost always music, of course. In Greece children go from house to house in groups singing Christmas carols, accompanied by the sound of a musical instrument, the triangle. 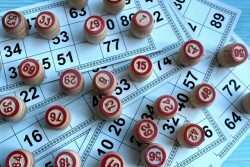 Games played on this occasion vary from cards in Macedonia to Bingo in Turkey, Tombola in Italy and the Yut board game in Korea. Very particular traditions include people spraying cologne to passing friends in the streets of Corfu, Greece (which apparently dates back to Venetian times), burning a straw witch on huge bonfires, and throwing old objects out the window, in Italy, buying new clothes in India, and wearing red underwear in Turkey. In Korea everyone automatically becomes one year older on New Year’s Day: when a child is born he is already considered to be one year old, if he/she is born in December he/she will be two years old on New Year’s Day (even if only days old!). 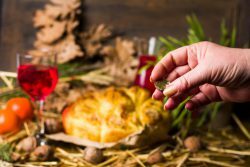 Celebrations can last several days or even weeks: in Macedonia, partying that started on 31st December continues with Christmas on 7th January, Old New Year on 13th January, the Baptism of Jesus Christ on 19th January and ends on 20th January with the big celebration of Saint John the Baptist! For some the new year can also be a time to pay homage to older family members: Korea there is a tradition of taking a deep bow, the Sebae, to elderly people in the family. 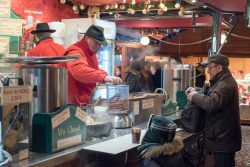 In downtown Brussels, many people go to or organize parties on New Year’s Eve, and on the first day of the year some are still celebrating, others haven’t slept enough, others still are recovering from a hangover. One restaurant where we often hang out has reinstated the tradition of the Choucroute, or Sauerkraut, on the first day of the year. Locals come in at any time of the day, sit down where there is still a chair, and wait for their pickled cabbage. Under each plate, there are some copper coins. Patrons are supposed to pick them up and keep them – they will bring prosperity throughout the year. In France, we celebrate New Year’s Eve with friends (contrary to Christmas with the family) around a rich meal with oysters and foie gras. As the clock strikes midnight, we bring out the champagne and we kiss under the mistletoe for good luck. This tradition dates back to the times of the Celts. Druids thought that the mistletoe was a holy plant which brought long life, fertility and prosperity. It is also a symbol of immortality as its leaves are always green, even during winter. The last day of the year in Greece is probably the day when one’s doorbell rings the most. From early morning, children in every neighborhood, usually in groups of two or three, go door to door singing the “Kalanda”, the new year’s carols. The classic instrument used to accompany the songs is the triangle. Children start by asking “Should we say it?” or “Should we sing it?”. The answer is always “yes” and when finished, they receive some change. As a child with my sister we followed this tradition every year and usually made enough to buy a book or a toy. In the northern part of Corfu, a very particular tradition takes place every New Year’s Eve, which is said to come from the Venetian times. People walk along in the streets and spray cologne to passing friends, acquaintances, family, etc. wishing them “kali apokopi”, that is to “have a good cut” of the year that is ending in order to welcome the new year. At the same time, groups form to sing Corfiot carols that sound more like serenades than Christmas or New Year’s carols. New Year’s Eve in Greece is spent with family around the dinner table. At the end of the dinner and after midnight, the hostess will cut a cake called “Vasilopita” (Basil’s Pie) which contains a coin. The pieces of the pie are cut in order: one piece for Jesus, one for Mary, one for the house, and then by order of age for every person from eldest to youngest. The one who finds it will have good luck over the year to come. India is a country of diverse cultures and the new year traditions and the time of the celebrations vary across regions. Nowadays, people do celebrate with a great meal, fireworks and parties on Dec. 31 but the traditional celebrations as per the solar or lunar calendar remain equally important for Indian families. For instance, in many parts of India, such as in Punjab, West Bengal, Assam, Tamil Nadu, Maharashtra, the celebrations are in mid-April around the spring harvest time. People from Gujarat and Rajasthan celebrate around October-November during the ‘Diwali’ festival and people from Sikkim bring in their new year in December. Typically, people buy new clothes, prepare their traditional meals, pray to the Indian deities and organize cultural events with friends and family. In my part, West Bengal, the new year celebration is known as ‘Poila Boishakh’ (First day of the Bengali calendar). 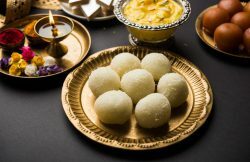 The special food usually includes a variety of fish dishes and famous desserts such as the ‘Rasgulla’ which is an Indian cottage cheese dumpling cooked in sugar syrup and ‘Payesh’, a rice-based pudding. On the last night of the year – dedicated to Saint Silvestro – people eat lentils, which are said to bring good luck and prosperity in the new year. This tradition dates back to the times of the Romans, who used to give as a present a leather bag containing lentils. It was hoped that these would turn into coins (lentils do look like little coins): the more you ate the more fortune would come your way (Roberta). In a remote region of the North East of Italy called Friuli we symbolically “bury” the Old Year and welcome the new one on the 5th or 6th of January with huge bonfires where people burn waste materials. 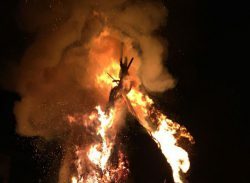 Sometimes a straw witch dressed with old clothes is placed on the bonfire, an effigy of the “Befana”, an old but kind ugly woman who delivers gifts to children flying with her broom. In the South of Italy, in Naples in particular, people throw old objects out of the window. Tombola, a traditional board game similar to bingo, is played throughout the Christmas festivities (Pisana). 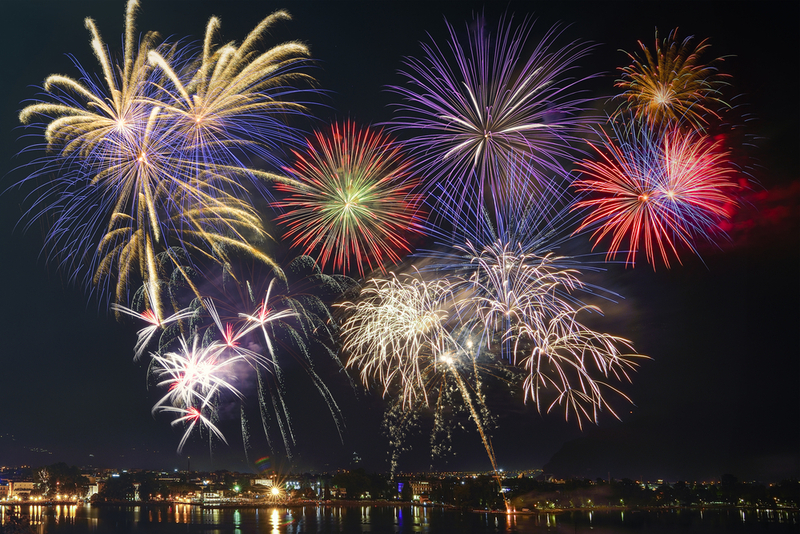 The end of the calendar year is maybe one for the biggest celebrations in the country. People in the Republic of Macedonia party with friends at home, in pubs, restaurants, outdoors at the public squares at concerts organised for this occasion, or travel to exotic places to attend glamorous parties. Wherever they are, they make sure to eat, drink, dance and have fun, and to look at their best. Outfits are festive, and often acquired specially for this evening, together with a different outfit for the 1st January party. This may be a show case of the Balkan magical thinking, when everybody believes that the sheer change of the date will bring improvement and miracles. The Macedonian rakiya (strong alcohol made of grapes) helping. And 2nd January is a bank holiday, too. This is the season when we decorate the New Year fir tree, known as the Christmas tree in other countries. And “Grandpa Ice” (Santa Clause) brings gifts to all kids. Actually, 31st December is not the traditional New Year’s Eve. It is the holiday season that was fostered and encouraged by the communist party in the former Yugoslavia as a celebration that united people with different religions and traditions that found themselves to live in same country after WWII. According to the Orthodox Church Julian calendar, the last day of the year is on 13th January. Namely, the Macedonian Orthodox Church is among those that still use the Julian Calendar and celebrates Christmas on 7th January, while the year starts on 14th January. This explains the New Year fir tree and the Grandpa Ice (in addition to not having religious holidays during the communism). And on 13th January, we also celebrate, this time we say goodbye to the “Old New Year”. It is less festive, but it is a lot of fun. In my town, the 13th January is reserved for friends and gambling. At home, in pubs or in restaurants, friends get together and play cards, eat again and drink more and have good time (we are very good at it). The traditional bread with a coin in it is shared among the friends, and the one who got the coin will welcome the same gang the next year. The partying that started on 31st December continues with Christmas on 7th January, Old New Year on 13th January, the Baptism of Jesus Christ on 19th January and ends on 20th January with the big celebration of Saint John the Baptist. Most people celebrate the Lunar New Year (= Chinese New Year) rather than the solar NY. The lunar New Year is usually in February. On New Year’s day, we eat rice cake soup: the white things in the soup are slices of rice cake (not exactly a cake in the sense that the texture is more like a very sticky ravioli dough). In Korean, it’s called Tteokguk. We do a New Year’s deep bow to elderly people in the family. The New Year’s deep bow is called Sebae. Then the elderly person gives words of wisdom, a wish and pocket money (!). One typical game we play on New Year is called “Yut”. It is a board game, sticks called Yuts are thrown on the board. What’s most fascinating may be that EVERY Korean is one year older on the New Year’s day. Well, in this case, the Western New Year’s day. Even though most people celebrate the lunar NY, for age counting we use 1 January. I don’t know why… When a baby is born, s/he is already one year old at the moment of birth. And on New Year, one year is added to his/her age. Because the first year comes at birth and the second on the first day of the New Year, children born, for example, on December 29 will reach two years of age on the New Year’s Day, when they are actually only days old. Everyone born on the same calendar year effectively has the same age and can easily be calculated by the formula: Age = (Current Year − Birth Year) + 1. However, in official documents, we use “exact”/”official” age (counted from the date of the birth). When you meet a Korean on the street and ask their age, they’d use the first one unless you specify that you’d like to know the “exact”/ “official” age. Some say it’s because people count the 9 months we spend in the womb. My guess is that this is for a practical reason. We have about five different forms of addressing people. Formal and polite, formal but neutral, informal and neutral, etc. Age and social class play an important role in selecting which form to use. If we were to count age from the actual birth, it would be quite complicated. By putting everyone who is born in the same year in the same age group, one just needs to ask one question “how old are you?” to decide which form to use. People born in the same year would use the neutral form with each other. How people in Spain celebrate New Year’s Eve might vary across families and groups of friends, but I would say most people have a good dinner with their families, then eat 12 grapes at midnight, then some (especially the young) might go out to party with other friends all night, whereas others (especially the elder) might stay at home and drink and talk round the table, or watch TV. What happens before and after midnight probably is not so different from other countries, so I’ll focus on what happens at midnight itself. One original tradition we have in Spain is to eat the 12 grapes with the 12 bell tolls at midnight. If you manage to eat them all, one grape after each toll, one grape for each month of the coming year, you will be lucky in the new year, or at least on the months for which you managed to eat the grape without choking. So if you have dinner with a Spanish family on New Year’s Eve, don’t be surprised to find 12 grapes ready next to your glass. You’ll be glad for some fruit after all the seafood and/or roasted lamb or whatever the traditional dish is in that house. The TV tends to play a key role that night. Many people have it on all evening, and normally there is a long TV show of variétés with some tacky old glories as presenters and as guests. 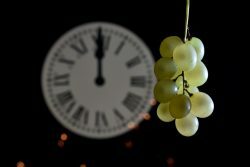 As many people don’t have a clock at hand, the TV show broadcasts live from the Plaza del Sol in Madrid, where originally the grape-eating tradition started as a gesture of popular mockery towards the bourgeoisie and the new rich. In that square, there’s a big clock which bell tolls (the “campanadas”) everybody listens to attentively so as to know when to eat their grapes. We have street decorations similar to Christmas lights, and people set up Christmas trees, use Santa Claus images. We do on New Year’s Eve what other countries may do on Christmas Eve. We exhange gifts among family and friends, enjoy a big family dinner, and usually the main dish is turkey. We watch special TV broadcasts, and play games; New Year’s eve is nothing without a round of bingo. We believe that the new year will end the same way it started, so many people do a big effort to start their new year in a good mood. Women wear red underwear hoping that this will bring luck in their lives.